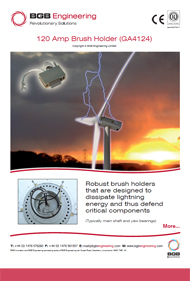 BGBs Lightning Brush holders are robust units that are designed to dissipate lightning energy and thus defend critical components (typically main shaft and yaw bearings). The 120 amp brush holders, when used as part of a total lightning and surge protection system, play a very important role in the protection of buildings, structures and equipment against direct lightning strikes. 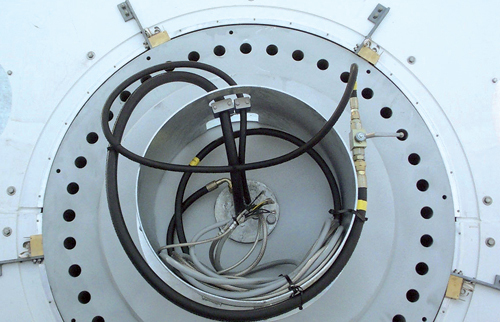 Arc propagation brackets are also available to act as backup for overload conditions. A low impedance path is created through the rotational interface (hub to nacelle) from the lightning protection conductor to the ground, therefore protecting the main bearing.